Since Soviet times, Belarusian recognition mark was red star, in the year 2009 replaced by folded national flag on fins - red and green. 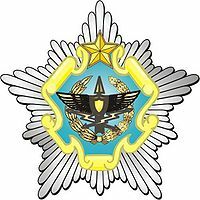 Ваенна-паветраныя сілы і войскі супрацьпаветранай абароны [Belarusian Air and Air Defence Forces]. Former BeloRussian (ByeloRussian) Soviet Socialist Republic, independence in 1991. Belarus inherited MiG-29 and Su-27 in 1991 when USSR splits (MiGs in Бяроза-Kартуская [Biaroza], Sukhois in Баранавiчы [Baranovichi]) and withdrawed 11th May 1993 from East Germany (Soviet MiGs from Finow - Eberswalde 787th Fighter Aviation Regiment) to Belarusian airbase Ross, later to Baranovichi, Brest region. December 2012: all Su-27 were retired from service. 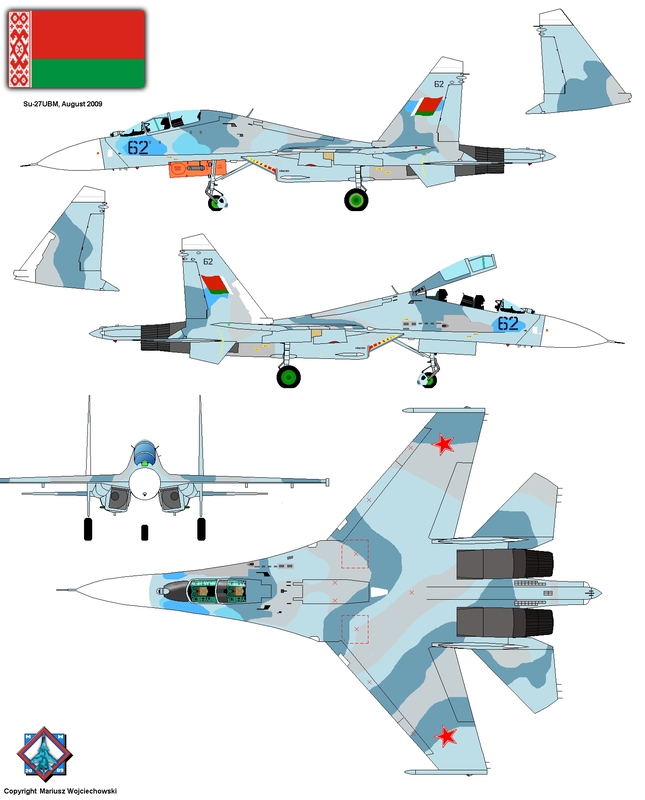 Belarusian MiG-29 and Su-27 were overhauled, also modernized: MiGs between 2003 and 2005, and Sukhois between 2004 and 2005 (also Mi-8MTK01 helicopter). In 2003 Belarusian РУВП 558-ы авіяцыйны рамонтны завод [558th Air Repair Plant] in Баранавічы [Baranovichi] start a modernization programm, in cooperation with a Russian enterprises ОКБ "Русская авионика" [Russian Avionics]. Between years 1996 and 2003 all Russian modernization project failed: MiG-29SMT (9-17, 8-18, 9-19), Su-27UBM (project T10UM, upgrade of Su-27UB to multirole fighter), Su-30KN (project T10PM2, upgrade of Su-27UB and Su-30 to multirole fighter), developed by Mikoyan Bureau and Irkutsk IAPO. Only a Komsomolsk-on-Amur KnAAPO realised a programm Su-27SM (project T10SM, upgrade of Su-27S/P to multirole fighter). Then "Russian Avionics" join efforts with Baranovichi plant and quickly developed MiG-29BM (2003) and Su-27UBM-1 (2004). 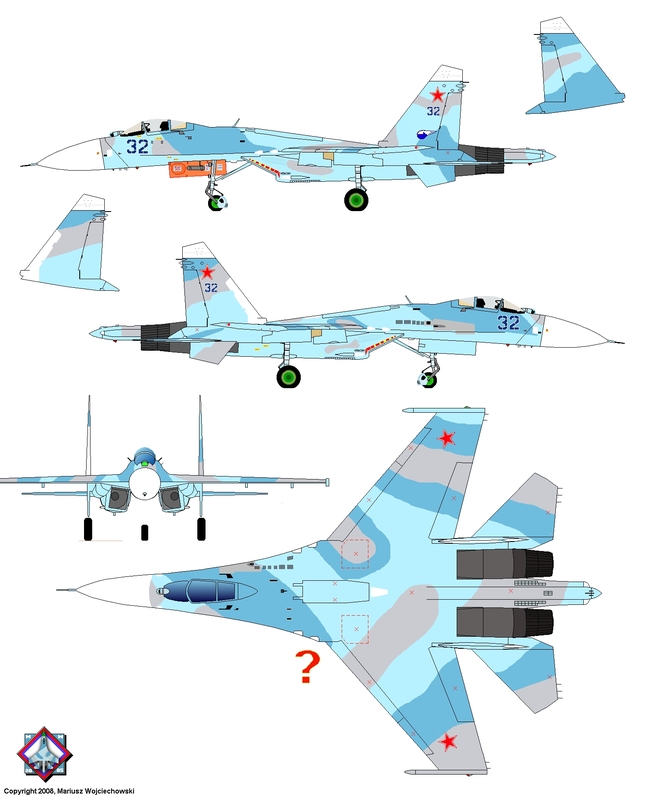 Su-27UBM-1 it's a standard similar to Su-30KN, with precision bombs and air-surface rockets (Kh-29T, Kh-29L, Kh-31A, Kh-31P, RVV-AE, KAB-500Kr and KAB-500L), unguided rockets (S-8) and improved radar. First public appearance at MILEX-2005 in summer of the year 2005 - aircraft numer 60. Modernized are only two-seater Su-27UB, probably five aircrafts, between 2004-2005. Belarusian Su-27UBM-1, 2009. Camouflage on top is a little schematic. Since summer of the year 2009 national flag on fins! 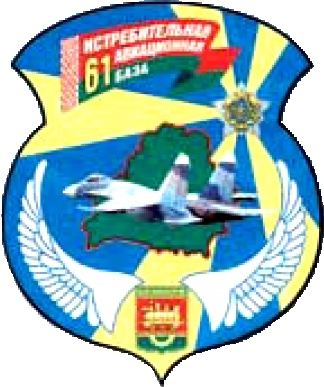 A great success for Baranovichi 558th Air Repair Plant was a modernization of ten Kazakh Sukhois, ended in June 2010, to improved standards Su-27M-2 and Su-27UBM-2. Aircrafts were equipped with Belarusian and Israeli systems and armed with precision weapons. End of 2011: after years of rumours and denies, it's a fact: Indian 18 Su-30K (first batch 1997-1999, produced by IAPO, Irkutsk) were returned to Russia, then shifted to Belarus. They will be modernized to Su-30KN standard in 558th Air Repair Plant in Baranovichi, where successfull modernization of the Belarussian (Su-27UBM-1) and Kazakh (Su-27M-2 and SU-27UBM-2) Sukhois was realized. Each aircraft is worth USD 10 mln, upgrade USD 5 mln. Maybe they stay in Belarus or will be sell to third countries (in 2017 12 aircrafts are bought by Angola). In 2012 aircrafts were overhauled in Baranovichi 558th Air Repair Plant, Sukhois almost for sure will be modernized. Belarusian Su-27, 2005. Camouflage on drawing it's only a scheme. *Crashed in 1996, pilot Uladzhimir Karvat is dead. ** One and only aircraft in unusual green-brown camouflage, probably for foreign customer (about 2000). When sale was not realized, aircraft was repainted in lightgrey. *** August 30th 2009, during air show in Radom (Poland) Su-27UBM-1 #63 crashed. Pilots are dead: Alexander Marfitsky (Марфицкий), deputy head of the Western Operational and Tactical Command of the Air and Air Defence Force, and Colonel Alexander Zhuravlyevich (Журавлевич), deputy commander of the 61st Fighter Air Base in Baranovichi.